Mobile billboard advertising in the form of advertising vans advertising bikes and advertising trailers can be a very powerful medium. However, like all advertising, it is only as effective as the message it communicates and most importantly, how that message is delivered to best effect. The viewing audience of the ad van, ad bike or ad trailer advertisement are on the whole mobile with people either passing in vehicles or walking past the advertising vehicle to their destination. 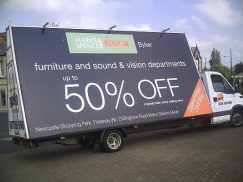 This limits the potential viewing time of an outdoor advertising message to only a few seconds.